I know in January of 97 campus closed three days in the same week due to actual temperatures around -40F. I graduated in Spring 2003 and remember a couple days. One was for sure coming back from a break (Thanksgiving or Christmas) and half the students didn’t make it because all the highways in the UP were closed. We picked up another student who’s ride had crashed on 28 before Munising. Another was the day before (spring?) break and a huge ice storm. I bet I still have a dent from falling down the steps of the MUB going to check on my lab. That was definitely 2003, the other may have been my junior year. I’m pretty sure that was a 50 inch storm. Looks like Tech admin and students are getting soft – much like the current curriculum. Bring back the Quarters! -40F isn’t an excuse to close anything – that’s why alcohol was invented! 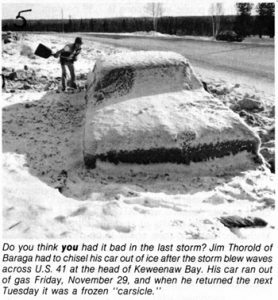 I do remember January 1972 (I would not have remembered the exact day) shoveling an extra large amount of snow to get my car out in Laurium and going to class to find out my professor was one of those who cancelled class that day. As a result I returned home a few hours later to shovel my way back into my parking space. It was also windy and we ended up with a larger snowdrift all the way up over the peak of the two story home we rented from the mining company. They wanted to have occupants, (I was married) since the mine was closed so rent there for a home was less than an apartment in Hancock. I was so glad when I got my first job with the Ansul Company and was able to buy a snowblower. November 14-15, 2002 Tech was closed. There was an electrical cable failure. Because of this, Thanksgiving Break started 2 days early. Emergency power cables were strung around campus in a dusting of snow. November 14-15, 2002 Tech was closed due to an electrical cable failure. Because of this Thanksgiving Break started 2 days early. Emergency power cables were strung around campus in a dusting of snow. I remember a closure around thanksgiving sometime between 01-05 for a power outage. If I remember correctly power went out Thursday morning and the made the call around noon Thursday to cancel the rest of the week and we all went home early. I remember one or two other power outages in that time. I know one was at night. I don’t remember whether those resulted in closure. 1997 wasn’t the -40 year. That was the first weekend of February 1996 (I was in Bessemer that weekend). Monthly low for January 1997 at CMX was -7, and -5 for February 1997. I started fall of 1996 and I only remember one cancellation for cold which was in my later years at Tech, guessing the 2000 closure. I don’t remember a closure for snow in 1997, but I missed Fall and Winter quarters from August 1997 – February 1998, so if it was December 1997, I wouldn’t have known about it anyway. Definitely getting soft! The technical clothing available today should make it even easier to battle the cold temps and snow! I remember the Jan 1982 storm. Was traveling back from an interview and the flights were cancelled. They bussed us up from Green Bay…the hockey team was also on the bus. It was nice not to have missed class! I can remember the Weather Service issuing a hurricane warning for Lake Superior on November 10, 1975….the day the SS Edmund Fitzgerald sank. Most of Houghton and Tech lost power. I believe Tech closed in the afternoon of the 10th, and perhaps the 11th. Walked to the First National Bank of Houghton (on the edge of campus) to withdraw my spending money for the week, $10. The bank was open, tellers were working by candle light and using a hand written ledger to keep track of deposits and withdrawals……no ATMs and limited credit card usage in those days!! I did not remember that we had closed on the day of President Kennedy’ assasination but it was likely only part of the day, as I do remember being on campus when the word circulated that he had been killed. It was a Friday. I remember being outside Sperr Hall when someone said he had heard the President had been shot. Then after the end of the next or later class Bill Malinowski said he heard on the radio that he had died. There was a power outage in late Oct. or Nov. of 1967, some transformer shorted out by wet snow. Classes were canceled late morning and all pm. Power came back on in late evening, messing up our lights-out party at Pilgrim Terrace Trailer Court. Turned off the lights and kept partying. Not buying the closure in 1979. I remember shoveling snow every morning and night all winter long. Shovel to get out of the shared driveway. Shovel to get back in. Never had a day off. I was there for the Thanksgiving return closure in 87. Driving back from Thanksgiving, we made it as far as Negaunee and finally had to stop. At the time, the joke was that the Dean would only close campus if he threw a brick out the window and it came back. Returning from the Thanksgiving holiday break from the LP on Sunday, November 26, 1967 the roads closed in behind us due to snow and there was no school for a couple of days. I was there the winter of 1978-79, snow fall that season…355.9”, the record for Houghton County and I can only remember 1 day when all classes were cancelled, and maybe one other when campus was closed early. It snowed EVERY DAY. We lived on Montezuma and would watch the crews blow the snow into dump trucks and haul it away every night. I agree with Bill Massy relative to snow but school was closed for the Kennedy funeral. I left early on Saturday since Thanksgiving break was the week after the assignation. I also remember being in Hubble Hall for a class when the news arrived. I do not remember a 1972 closure. Maybe it was just some classes? Class of ’70 – don’t recall that temperature or amount of snow made any difference – Dr. Moyer’s Advanced Physiology class met at 7:00 A.M. every MWF all winter term – required attendance. I do remember coeds coming to class in their mini-skirts with frost on the knees of their nylons when it was well below 0. I know the county had a big snow blower for clearing roads, but for some reason they left a large berm of snow in the middle of US-41 which went through campus and some kind person(s) would dig walk-ways through it. Thanksgiving Drive in ’85. We made it back to Tech prior to the road closure and played football that night in what is now Lot 10 (across the highway from East Coed/McNair). I spent Monday (the day Tech was closed, first day of new Tri) sick in bed, but I was good to go Tuesday!! My (now wife) Carol, was stranded overnight in the Marquette/Ishpeming area due to the highway closure (we didn’t know each other yet….:). Classes were cancelled on the Monday and Tuesday after Thanksgiving break in 1966. It wasn’t so much that the campus was hit with bad weather but rather because so many students were unable to make it back to the school on-time. There was a very large storm with heavy snowfall in the Southeastern end of the UP which forced the bridge to close. Even most of those who got across in time were later held-up by the drifting snow on US 2 and other West- and North-bound roads. I was lucky as we took a route that missed the worst of the snow and we made it in later Sunday night, but my younger brother left an hour after me and he was hung-up in Blaney Park on M 77 for two days until the roads were finally cleared. I was there for the 1/18/96 closure and agree that there was a second closure that winter, but I can’t remember any details. The closure in January or February 1997 was caused by very cold wind chills (-40) and whiteout conditions. There wasn’t a lot of snow falling, but it was really blowing around. Despite the official recommendation to stay off the roads, my roommates and I drove out to McLain State Park to experience the full brunt of the storm. It was cold (and stupid). I also recall a power outage closing the campus for an afternoon in September or October 1998. I heard that a “squirrel ate through some power lines.” Maybe it was Spring 1999; I remember it being a warm day. I don’t buy the 1979 closure either. It snowed everyday that winter from Nov. 9 through Feb. 16, except for Dec. 16. But classes were never cancelled. And don’t buy the -40 degree real temperatures. I was on the faculty at Tech from 1974 until 2014. Coldest temperature ever was in early 1994. For the first four days of the week, the high temp was never above -10. Classes weren’t called until Thursday. But the low temp that week was -30. Check the weather service records. I don’t believe you’ll find a lower temperature in Houghton between 1974 and 2019. Sure looks like the trends are that the school closes a lot more often than it ever did in the past, and I doubt the weather is significantly worse. Conclusion…kids are not nearly as tough these days as we were when I was I school!! Well, looking at real data, I have to modify my statement. January 17, 1994 – high 1, low -14; Jan. 18 high -14, low -20; Jan. 20 high 0, low -20; classes cancelled on Thursday, Jan. 21 – high 5, low -5. Thursday, February 1, 1996 high 0, low -8; Feb. 2 high 0, low -22; Feb. 3 high 0, low -21; Feb. 4 high 2 low -23; Feb. 5 high 2, low -2. No need to cancel classes that year, as the worst temps were on the weekend. Definitely closed in 1972. I was on ski patrol at Ripley the day before and it was snowing so hard that you couldn’t see your tracks from one run to the next. And that was loading the T-bar at mid-station. Some people in our Chem Eng Unit Operations lab came in because they felt like they were already too far behind schedule (it was an 8-hour lab on Thursday), but most of the crew followed the closure. We must be becoming a bunch wimps. Note that there was no closings from 1938 to 1963! I remember no school closings during 1955-59. We simply walked through the snow and cold … toughed it out. A couple days I walked across Portage Lake from Dollar Bay. Seems like more closings in recent years during these times of global warming … hmmm! Notable memories from the 1982 closure: I was living in the basement of the Mining Gazette building. Huge runs on the grocery/party stores for “blizzard supplies”. Lots of cards/dice games at blizzard parties. Snowmobiles running freely on Shelden through downtown Houghton (no cars). Locked my roommate out of the apartment after blizzard party. He broke a window to get in, woke up to snow in the living room. Brrr. My wife Karen and I were there for the 1972 closure. I think we got about 3-4 ft snow overnight with temp about -30 and 40 mph wind. It was difficult to even see a street lamp light in the Heights that night. We couldn’t believe it when the morning news said Tech was closed. Tech never closes. I got her to work that morning downtown only a couple minutes late. The extremely cold weather in the midwest reminded me of the three winters I attended Michigan Tech (1946-1948). There were plenty of minus 20 degrees those winters & a week or so without getting above zero. That was to be expected. At that time I roomed at a private home directly across the street from the campus. The house had single pane windows with storm windows outside. One morning my clock radio woke me with the news the temperature was 48 degrees below zero. I looked at my window & saw 2 inches of frost build-up on the inside of the widow. I had been out in 30 below, so I didn’t want to find out how 48 below would feel. I never knew what the official temperature was. I didn’t go to school that day. I was on the ski team, trained 2 hours every school day, skied for 2 hours under the lights each night, and all day on weekends, a lot of times in below zero weather. The ski hill was directly across across the river. It was a long walk to the only bridge then back along the river to the ski hill. So one day, being sick of the long walk, I looked across the frozen river & decided to ski across by myself. Seemed like a good idea until I got about half way across when I began feeling & hearing very loud cracking noises. That set me to thinking about the large volume of cold water flowing beneath the ice. I hoped my seven foot skis were long enough to bridge a crack. As the cracking noise continued I thought, just let me make it this one time & I’ll never do it again. Where was my Mother when I needed her? When I first made it to California in July !948, I found I didn’t have to freeze at a football or hockey game, I was amazed. Still better, one could ski in California without freezing. I’m still amazed that on February first the Japanese Maples in Berkeley blossom every year. The locals don’t call that spring, but I do, with gratitude! As for skiing, after 86 years on the boards I decided to hang them up at 93. It has a been a great run. I remember Tech closing at noon during 79-80 winter. I don’t remember the date but I do remember a group of students from Wads tying themselves together like an expedition to go to Jim’s Foodmart for beer. I don’t remember the day, but the one in 1979 was only a half day, and it wasn’t snow, it was rain! 78-79 was my first year (lots of snow), but I think this closure was fall of 1979 (my second year). 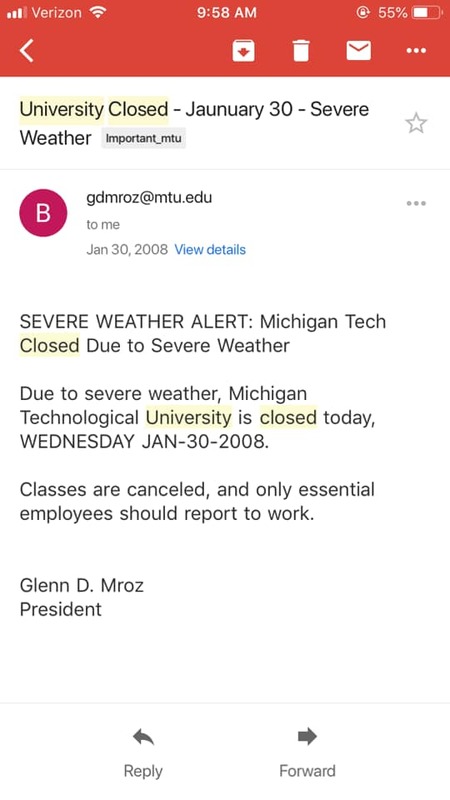 I do remember that it was the first time Tech had closed while I was there. Huge amount of rain in a very short amount of time. The parking lot across from Wads, by DHH had close to a foot of water. I remember seeing some cars floating and bobbing. It was deep enough that most of the cars had a couple of inches of water on the inside soaking everything. I don’t remember which entrance now (probably one of the rear ones), but water was flooding under the doord into Wads, down the stairs and into the bottom floor hall ways and study rooms. I don’t know what the rain did elsewhere on campus … I lived on the 5th floor of Wads (Sigma Nu Omega), and it was a good place to be at that time. I recall January ’94 cold temps, not sure of exact dates and temps. This was my first year and was taking ski class. I was heading up the rope lift and it stopped halfway up, as it did periodically. I skied back to see if operator needed help getting it going. He said Tech slope is shut down due to cold temps, and that the whole campus was shut down. I often wondered what the wind chill would have been that day on top of Mount Ripley where the wind was blowing hard like it usually did. I believe there was quite a few diehards on the slope that day. I was living in the home of retired math Professor “Anderson” my junior year at MTU. The house was on Houghton Avenue a few blocks from Jim’s Food Mart. We were told a wind chill of -76 was coming off the lake. I don’t remember anything closing Nov 10-11, 1975, but I do remember the wind tunnel between MEEM and Chem-Met being almost unworkable. Good thing there was no ice. Looking at the increased number of closures in recent years. It would appear our students are getting soft and administrations more risk adverse. We used to take pride in making it to class, bad weather or not. What is the world coming to. Stiffen up Tech. BSEE ’81. I see several comments about more closures because the students are getting soft. Keep in mind that it’s NOT the students that make the decisions about closings! It’s those in charge that are more risk adverse now. 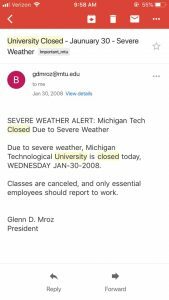 I’ll bet you still get students walking across MTU’s campus, with icicles hanging from beards, moustaches, or even hoods on parka’s. My wife was working at the Laurium hospital in the winter of ’68 -’69. There was a heavy snowstorm and I drove up to Laurium so we could drive home together. After digging out her car from a big snowdrift she followed my tail lights back to Houghton. I had to stop for gas and she went up M26 and got stuck on the back road to Dodgeville. A plow driver on the highway saw her and stopped, saw her uniform and asked “Where you going lady?” She said “Dodgeville”. He asked if she could get the car off the road when she got there and she said yes. He told her to follow him and “gun it” when she got there and get off the road. He said he was supposed to only be doing highways so don’t mention it to anyone. He plowed her home and meanwhile I got stuck on the road between Hurontown and Dodgeville near the Gundlach buildings. When she saw I wasn’t home already she sent out a neighbor on his snowmobile and found me and brought me home. 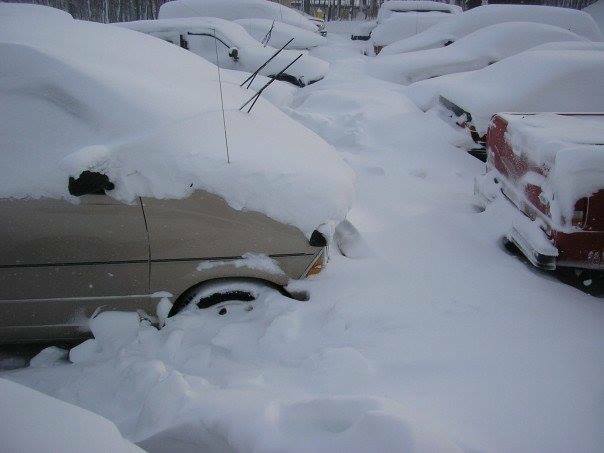 The next day my brother and I dug out my car. 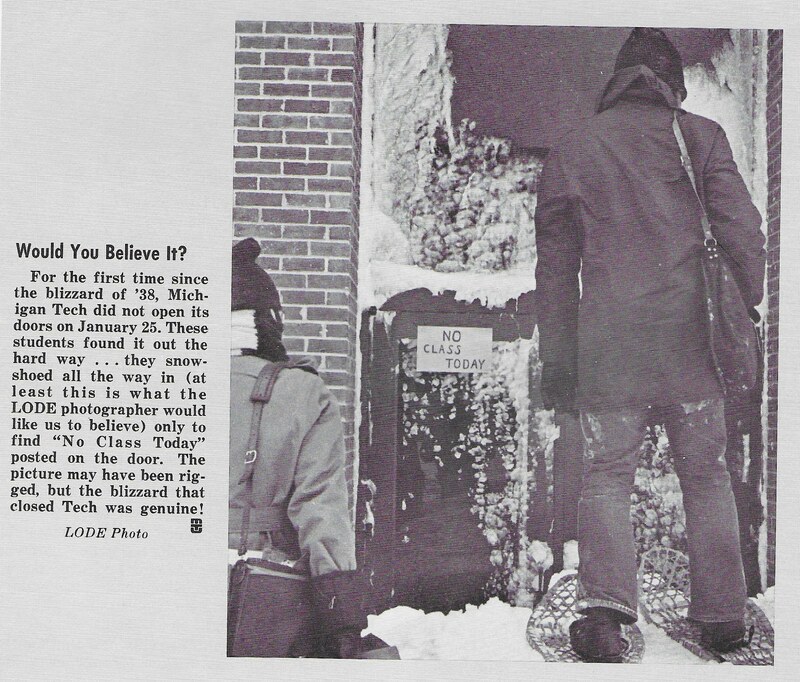 The school was definitely closed in ’79 for a day due to blizzard conditions. My buddy, Bob Eck had a snowmobile and we drove it into town to The Library for beers! The snowfall set a record that year. Close to 360 inches as I recall. It started snowing the last weekend in Sept (shortly after our arrival as freshman) and the last snowfall was the first weekend in May! We actually went to Misery Bay that weekend for a final party before leaving for the summer – and it snowed! I remember the big snows of 1971/72 and the closing of classes on at least that one day. I graduated on March 24 – yes we did have Winter Commencements back then, too – and the eleven inches of snow the day and night before Commencement did not cancel graduation….and we all left town a day later with adverse road conditions all the way to the Big Mac and beyond. My wife and I loved our time at Tech and have made quite a few Winter trips over the years. It’s GREAT TO BE A HUSKY – GO TECH!!! While this was not a weather related situation, there was another time that classes were cancelled, and that was in May 1970, after the shootings at Kent State. I was doing some free lance photography work at the time and documented the protests that were held on the steps of the Student Union. One of those images made it into the 1970 Keweenawan Yearbook. Several years after graduation, I donated these and other photos taken around campus during my student days to the MTU archives. Just for kicks, I did a search of the archives and found three pages of my photos, six of which were of the Kent State protests taken that May of 1970. A day or two prior to Thanksgiving break in November 2002 there was a widespread power outage. I can’t remember if the University officially closed or not, but I remember my classes being canceled and getting to go home for Thanksgiving break a couple days early. Re: Sept. “55”- June “59”, I was pleased to see that Paul Chambelain’s memory of that time at Tech confirmed my recollection of no weather-related closures. I think that the lowest temperature that we had in Houghton during that period was just -12 deg. F — and I did’t experience a lower temperature until the winter of 1963, in Cleveland, OH (-16). But, I don’t share Paul’s skepticism relative to climate change! We’ve not had a really cold winter in NE Tennessee since the winter of 95/96. 1. They calculate Wind Chill Differently now with the numbers being closer to zero for the same conditions. SO when you think it was -80 when you were there, that would now only be calculated at a -60 wind chill. 2. Due to more development, I bet students generally commute a bit farther to get to Tech than they used to, and the same with the professors. 1982: I remember 1982 the same as Don Kolehmainen’s, especially the record-low wind chill. 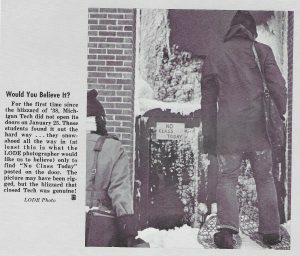 I lived at the top of Agate Street and Before I knew classes were cancelled, I was headed down from the top of Agate Street, where I think the wind chill was coming off the Portage (-76). I thought I had everything covered but I forgot my ski goggles so my eyes weren’t covered and my eyelashes froze shut from my breath. True story. I don’t recall anything in 1983, but the first day of classes for spring term 1985 was a half day off due to very high winds and snow. I think the wind gusts were near 75mph! Campus closed March 25, 1996 at 1:00 PM due to heavy snowfall.